For starters, leave home, and go away for a week. It doesn’t matter if it’s to the next town, state or country. Staycations are cool, but going away allows you to be immersed in a new environment away from all the good and bad stressors of your life. Unplugging, and pampering yourself with a well deserved vacation is a must. We love vising family but that doesn’t count. I’m talking about completely removing yourself from it all. Get an expensive massage, or treat yourself to something fancy that you don’t normally do at home. It’s worth every penny. After all, most people only take 1-2 weeks off for the entire 365 days of the year. You’ve earned it. We enjoy the desert and the mountains. In fact, we really enjoy Scottsdale, but it’s not new! Pick a brand new destination that you have never been to before. It can be domestic or international…you choose. Leave Scottsdale for a long weekend but definitely don’t count it as a true vacation. Attaching an evening or even a day to a work conference doesn’t count either. We fly 1-2 per month to chiropractic conferences or continuing education courses. In fact, we travel to Chicago one weekend a month for the Diplomate in Upper Cervical care (that’s a 3-year commitment!) but we don’t count that either. It’s work. Not vacation. Just this year we put up a world map in our home office and put pins on all the places we would like to experience. This way, we simply go to the map and choose. 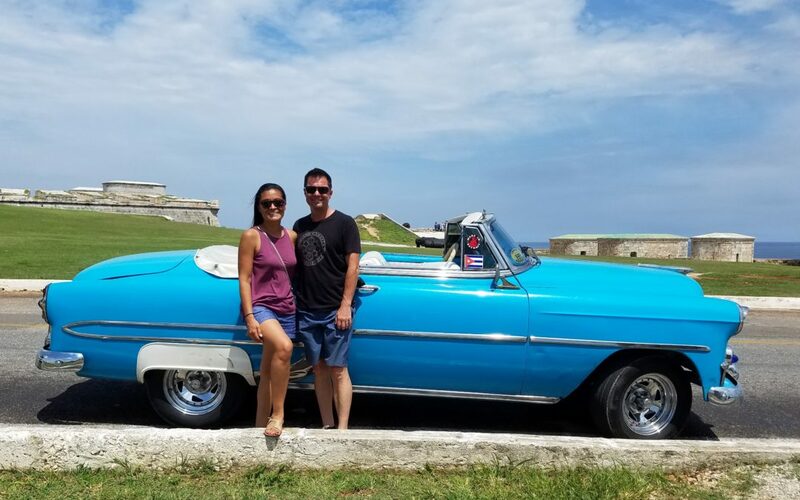 We just got back from Cuba yesterday, it was awesome! Talk about a time capsule! This trip was the inspiration for this post. Ask us about our trip when you see us. Leave the hotel restaurant for the tourists. It’s usually very little fun. We always and I mean always venture out. Fruit stand on the street corner…check. Soup for breakfast…check. Night markets with questionable dishes…check. Street tacos…check. The most amazing Pad Thai from the lady with a cart on any given corner in Bangkok for $1…check. Any hole in the wall that is in front of us…we go for it. Except mangos, I don’t like mangos. Ever. Unless you have a super sensitive stomach, we encourage you to venture out. There are few things while traveling that help you experience the people and the culture more than through their food. Give it a go; you won’t regret it. Don’t get us wrong, we love any 5-star hotel but there is something to be said about alternatives. We have stayed in guesthouses, hostels, Airbnb and VRBO apart from hotels. Some accommodations were as low as $5 night in Spain and Asia. Let’s just say you get what you pay for. However, some of our choices have been better than any hotel room you could have asked for and more. Our personal favorite was in the city of lights. A $75 per night Airbnb studio in the heart of Paris walking distance to everything. We became part of the scenery; it was wonderful. So branch out, look at maps beforehand to figure out where the city center is and explore your options for accommodations. It is oftentimes less expensive and way more fun. We enjoy taking a break, going on vacation, exploring new places and resting. Thank you for letting us share our experiences with you. We are back from Cuba, fully recharged and ready to take care of you once more. Call our office at 619-313-5403 to learn if NUCCA and upper cervical care are right for you.